Model L3P Sonic Sifter Separator is a superior sieving instrument especially suited for research and quality assurance applications. Using specially designed 3”(75mm) diameter acrylic-framed sieves and a patented oscillating air column, the L3P achieves dry, fine particle separations over the range of 3µm to 5.6 mm. The unit handles dry material in powdered, granular or pellet form. Practical separation of particles can be accomplished quickly - in less than 10 seconds under favorable conditions, freeing up technicians for other projects. Testing times can be cut by up to 90% compared to other methods. First, weigh a sample of powder, and select sieves for the analysis. The unit has a capacity of up to six standard or three precision mesh, double height sieves. All sieves can be conveniently direct-tared on conventional analytical balances. Assemble the sieves into the stack, introduce the sample, and lock the stack into the Model L3P test chamber. Set the front-mounted timer for the desired test interval and increase the amplitude to the proper power level for the sample. A periodic shock wave is imparted from the bottom of the stack to break down agglomerated materials and reintroduce the finest fractions back into the air column. 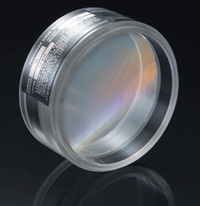 The sifting action is observable directly through the sides of the clear acrylic frames. When the testing interval has expired, the unit shuts off automatically. Disassemble the stack and reweigh the sieves with the retained samples intact, eliminating the need to transfer the retained materials to a weighing dish or paper for mass determination. 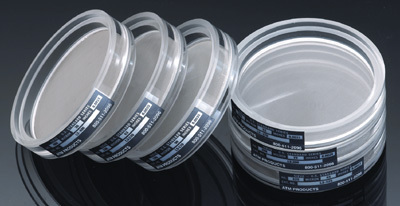 All fractions obtained in the analysis are retrievable for further analytical work, even materials passing through the 5 micrometer opening sieves. Two basic motions are used for particle separation. A vertical, oscillating column of air set in motion by an audio loudspeaker “tries” the particles 60 times per second on the screening surface. The oscillating air column in effect fluidizes the layers of particles on the sieves, much as a wet sieving procedure would accomplish. Then a vertical mechanical pulse shears agglomerates (similar to the hammer action in many conventional sieve shakers) and reorients the particles in the air column to assure accurate separation. No horizontal scrubbing of particles occurs as on standard sieves. This scrubbing is the largest single cause of particle breakdown or attrition. The input power level necessary to separate particles is infinitely adjustable by the operator as the test progresses. You are not locked in to a programmed run sequence which may not address the particular needs of a given sample. The L3P Sonic Sifter Separator can be operated successfully by personnel of virtually any skill level. 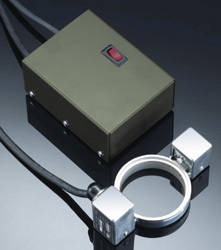 “See-Through” acrylic-framed sieves allow the operator to determine the proper power level for testing and aid in determining when the test is complete. 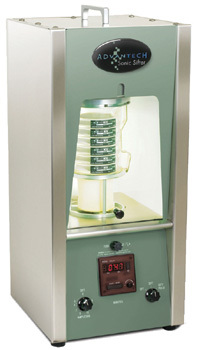 The sieving can be timed automatically to insure repeatable results. An electromechanical device designed specifically for use in the L3P Sonic Sifter Separator. The L3N8 produces a tapping action which was developed to help users obtain repeatable test results by eliminating another human element during test procedures. Designed to eliminate agglomerates frequently found in extremely fine powders, the L3N8 delivers a tapping action alternately on opposite sides of the screen frame. The tapping action creates a high speed shock wave or ripple effect across the screening media. The shock wave breaks down agglomerated materials, reintroduces ‘near-sized’ particles back into the air stream and then back onto the screening media. The L3N8 is a must for accurate separations below 45μm. Stack column accommodates a maximum of 6 sieves. All U.S. Standard sieves listed meet the current sieve specifications of ASTM and ISO. Stainless steel mesh with clear acrylic frame. Stack column accommodates a maximum of 3 sieves. All Precision sieves listed meet the current sieve specifications of ASTM and ISO. Electroformed nickel mesh with clear acrylic frame.